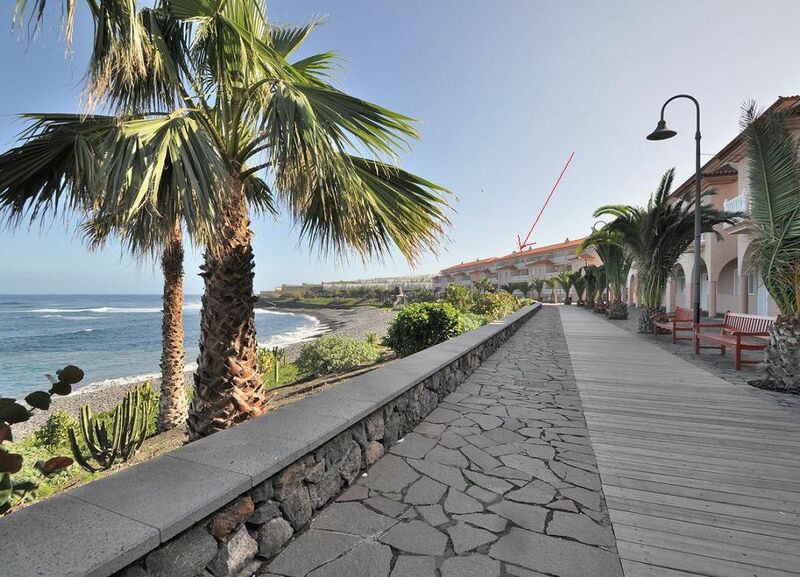 Our penthouse is located opposite the beach of La Caleta de Interian (Garachico), in the 2nd floor of a luxurious apartment building, with a beautiful view of the ocean bay. The penthouse, renovated in 2010, offers all comfort, the kitchen and bathroom equipments are full as you can see it on the pictures. 2 south and north facing terraces, each one of 15 sqm, equipped with electric blinds, tables, chairs, hammocks, invite to enjoy delicious meals under the sun. By the pedestrian dyke you walk along the coast towards to the banana plantations, or to the quaint village where you will find restaurants, shops, etc. 300 m away you will find a supermarket and a bus stop. The historic village of Garachico is 3 miles away. Our penthouse has a garage in the building (automatic gate) and allows you to stock sports items (surf board, fishing equipment, bikes, etc.). We wish you happy holidays. Laura and Paul. An inside staircase leads you from the private garage into the garden, from there another staircase drives you direct to the penthouse. Before you a big living-diningroom with access to the seafront terrace. At your righthand side a fully equipted americain kitchen and window facing the beach. On your left, a fully equipped barhroom with window facing the mountains. And 1 bedroom (bed 1.60 x 2.00m) with access to mountain view terrace. The bathroom is opposite de bedroom. Fully equipted. With mountain view. Soft towels. Good illumination. 2 handbassins. Mirrors, hairdryer. Wardrobe with cleaning products. 1 washmachine and 1 dryer. We were met by Laura and her son who gave us a very thorough run through everything that was available in the apartment which extends from mountain bikes to juice maker. In fact one of the challenges of our weeks stay was to try and think of something that wasn't supplied! The apartment was very, very clean with pleasing modern decor and was, exactly, as it was shown in the photo's and described on the internet. La Caleta is a quiet Tenerifian village not, necessarily on the tourist trail. The beach, which the front balcony overlooks, is, mostly, grey pebbles but quiet and secluded (at least it was in February). Good supermarket and restaurants within walking distance so no need to drink and drive! Would recommend 'Mundial '82' restaurant that overlooks the sea. Good food and wine at, very, sensible prices. i.e. 2 course meal for 2 with good wine and beer 40 Euros. A car is an absolute must, unless you like buses, the underground garage at the apartment was very convenient. If you're driving around Tenerife from La Caleta be prepared for some serious hills and hairpin bends. The road to Masca, which is a fabulous village, will definately exercise your arms on the steering wheel! We would definately recommend this apartment and award 5 stars. Who could possibly hope for more? Staying a week in early November was truly like charging the batteries before the long Scandinavian winter! Our hosts made us feel very welcome and the apartment had virtually everything, including mountain bikes! Garachico is off the main tourist-invaded areas (a bit dull if you look for entertainment), but close to spectacular sceneries and in all aspects breath-taking walks in the mountains. We booked the apartment direct with the owners, Laura and Paul, and the process was incredibly easy. Before we arrived in Tenerife Laura had sent us information about the area and how to find the apartment via e-mail. Once we arrived in Tenerife and picked up our hire car, we followed the directions provided and phoned Laura when we were about 2 miles from the apartment and her and Paul met us there. Both Laura and Paul were superb. They showed us everything in the apartment, told us where the local amenities were, and left us with their phone numbers and directions to their house in case we needed anything. The apartment was excellent, very clean, well maintained, and everything you could possibly need. There is parking that comes with the apartment, and a lockup where there are things like bicycles, walking poles etc for use during your stay, they really have thought of everything you could possibly need to make the most of your stay. The location of the apartment is also excellent, nice and quiet, a balcony on the front overlooking the sea, another at the back, really peaceful and we enjoyed having breakfast everyday sat on the front balcony watching the sea and the locals going about everyday life. The village has some really good restaurants, we enjoyed in particular El Patio which we ate at most nights during our stay. We stayed late October early November, and it was still very warm. The apartment doesn't have air conditioning, and this would be the only down side if you were stopping in the hotter summer months. If we were returning to Tenerife, we would definitely stay here again, and wouldn't hesitate to recommend it to other travellers. Dit penthouse is lux, heeft een heel mooi uitzicht op een baai en ligt in een rustige omgeving. Regelmatig zie je surfers bezig. De eigenaar is heel vriendelijk en enthousiast en geeft tips over wat je allemaal kan doen en waar je goed kan eten. Het appartement is van alle gemakken voorzien. Bij aankomst lag er fruit klaar, chocola en waterflesjes. Je kan prima zelf koken als je wilt, maar uiteraard ook lekker uit eten gaan. Echt een aanrader als je van rust houd. Als het even wat minder weer is rij je naar een ander deel van het eiland en je zit weer in de zon. Wij hebben ontzettend genoten. Tip: een auto is wel handig en je kan deze parkeren in de garage onder het appartementen complex. Thank you for choosing our property for your holidays. It is a great pleasure to know that all your expectations were met, and that you enjoyed our services and facilities. We would be pleased to welcome you again in the near future. We are delighted to read the great experience you had in our property. We would be very pleased to welcome you back in the future. Un appartement parfaitement équipé, tout est fait pour sentir comme chez soi ,une literie excellente, des serviettes de plage, tous les ustensiles et matériel de cuisine, des livre, des tongs , des transats pour la terasse, des velos....nous avons rarement vu une location si bien équipée !!! Un emplacement ideal par son calme et sa localisation sur le front de mer ! Une des plus belle partie de l ile ! Un accueil super sympa avec plein d explications et meme une corbeille de fruits ! Bref tout est parfait, grand merci à Pablo ! Nous souhaitons vous remercier pour votre appréciation a propos de notre propriété. Nous sommes ravis que vous ayez apprécié votre séjour dans notre propriété. Au plaisir de vous revoir parmi nous. Le prix de location pour 2 personnes et 7 nuitées est de 350€ tout inclus. ( prix de location pour 2014 ) 420 € pour 2015 Le prix de location pour 2 personnes par nuit extra est de 50€ la nuit. ( prix de location 2014 ) 60 € pour 2015 L'enfant de moins de 2 ans est accueillit gratuitement. La 3ème personne peut être logé sur un lit de camp dans le living, moyenant le supplement de 15€/nuit.